October is here and it is time to start a Project that Sarah and I came up with over the Summer: 31 Days of Pumpkins. Every day of this month we will be doing something with pumpkins. It might be a recipe, it might be a craft, it might just be a visit a to a pumpkin festival. The pumpkin is the quintessential American Autumn squash and I can think of no better way to spend the month than in celebration of it. We thought of this idea over the Summer but it’s origin can be traced back to November of last year. Halloween had come and gone and it was time to get rid of the Jack o’ Lanterns. Sarah read that Pumpkin plants can grow from the remains of an old pumpkin. So she decided to give it a try. Two rotting pumpkins were left at the side of our house, literally right next to the side door. It looked bad. 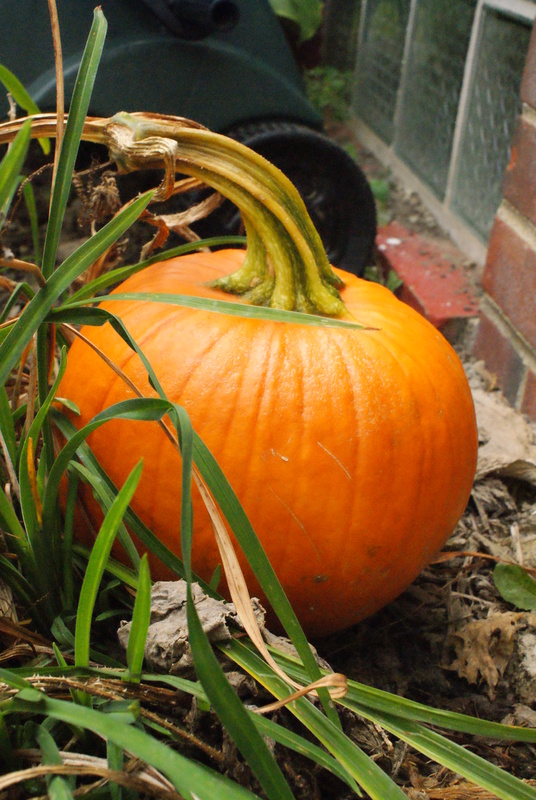 There were many days that I would come home and look at the two mushy pumpkins and think of composting them. It was best in the winter when they were covered in snow, but worst when they weren’t covered and people came over. How embarrassing. 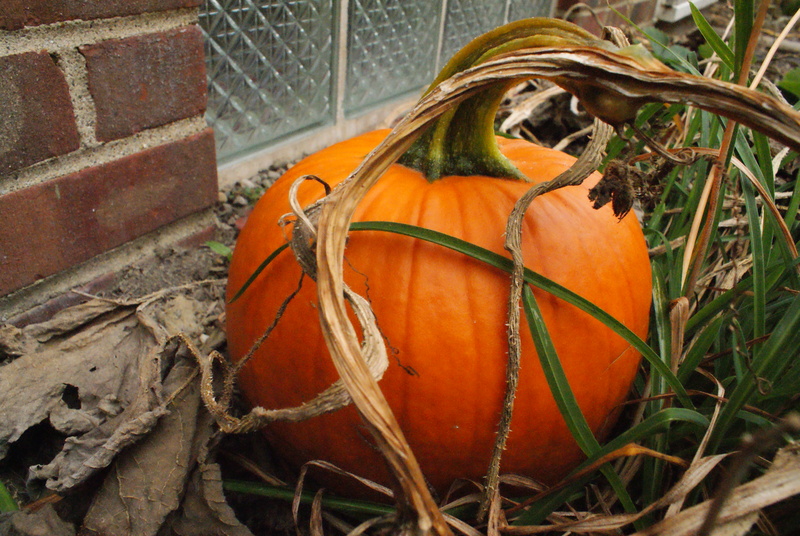 But in the Spring, after months or decomposing to nothing more than a hollow shell, Sarah removed the last remnants of the pumpkin top to discover hundreds of pumpkin plants growing from the residue. These plants grew. They grew and grew. Sarah had to do some culling. Many of the plants were given to friends and family. Many more were left out to wither outside of the soil. We ended up with a couple of plants that soon overtook the side of our house. The vine extended about 10 feet. The leaves were very large. Eventually big yellow flowers started sprouting out. But would they go to fruit? 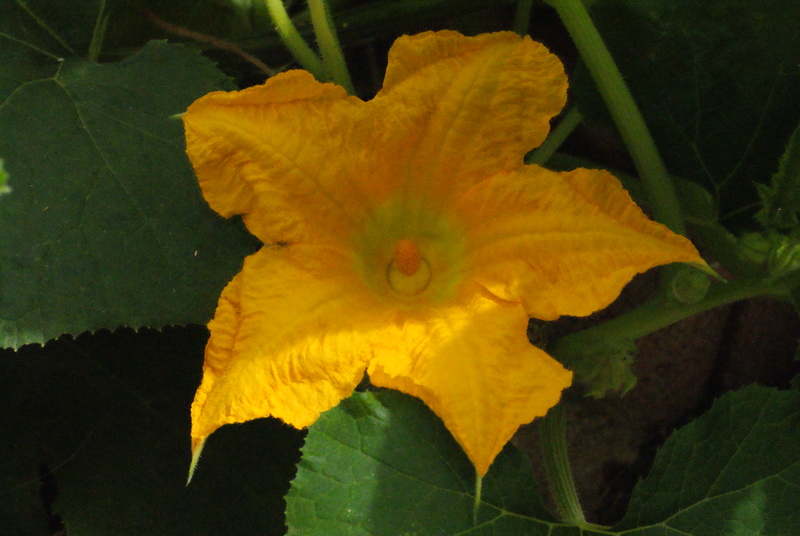 A friend told us that bees were good pumpkin pollinators. This same friend also told us she was pollinating the flowers herself. Sarah and I weren’t that committed so we left the plants to nature. For the longest time nothing was happening. I suppose I could have used the time to look up the life-cycle of pumpkins but I remained in the dark. One day in mid-Summer though I came home to see a bulbous growth on one of the vines. A few days later that growth had a definite pumpkin appearance. Then I found another one on the other vine. Yes, we were growing pumpkins. Penny and the neighbors were excited to watch the progress of our 2 pumpkins. They grew in size and started to turn orange. They didn’t turn out very large, but they sure were nice-looking. 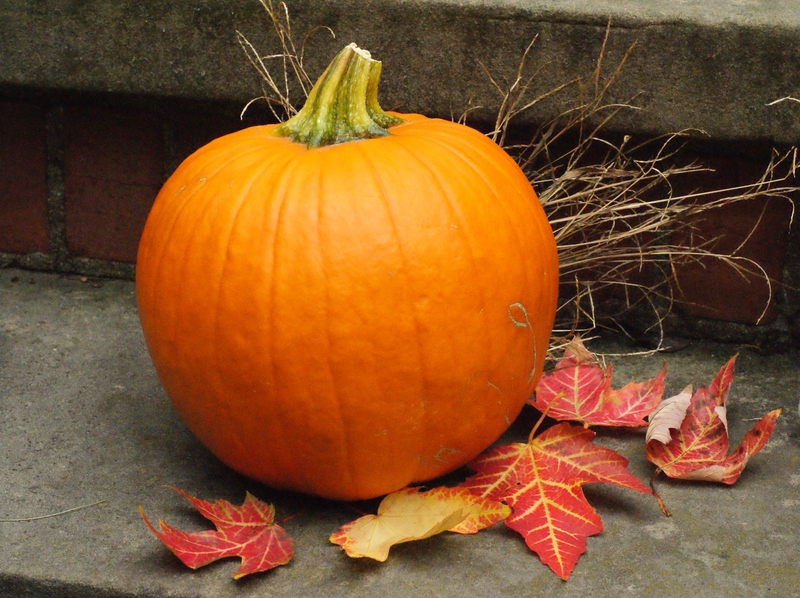 We displayed them on our porch for a couple of weeks, but just today we cut them up and processed them into puree. Tomorrow they will be used in our first recipe. Come November, when another Halloween rolls by we will do it all over again. This time we will find a better spot for our patch. Tomorrow will be Pumpkin Biscotti and the next day will be Lentil and Pumpkin soup.